Governor Cuomo announced the plans last Friday, but he had originally floated the idea back in September. The Farley Building sits to the west of Penn Station and under Cuomo's scheme, it will go from once holding letters to instead accommodating 700,000 square feet of retail, commercial, and dining areas with the Moynihan Hall serving as a train hall for Amtrak and LIRR services. 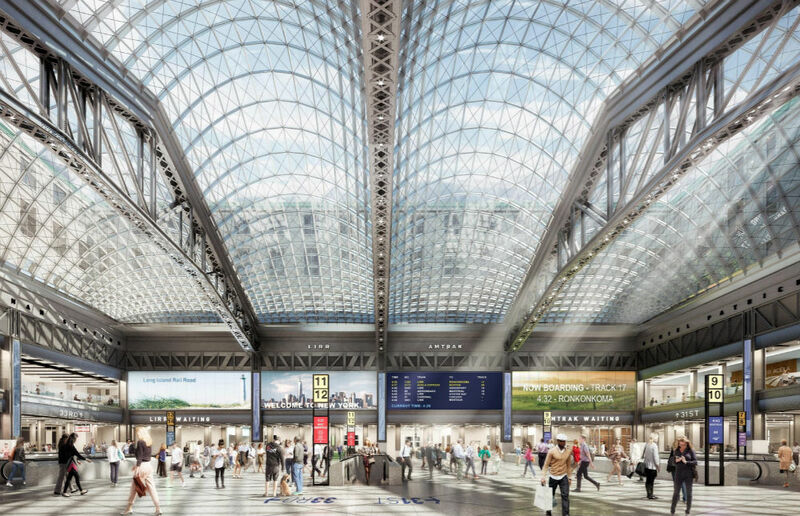 "Fifty years after the loss of the original Penn Station structure, passengers will once again experience a world-class rail hub worthy of New York," Cuomo said in a press release. "The Farley Building’s Moynihan Train Hall is two decades in the making, and we are proud that this project is finally a reality. 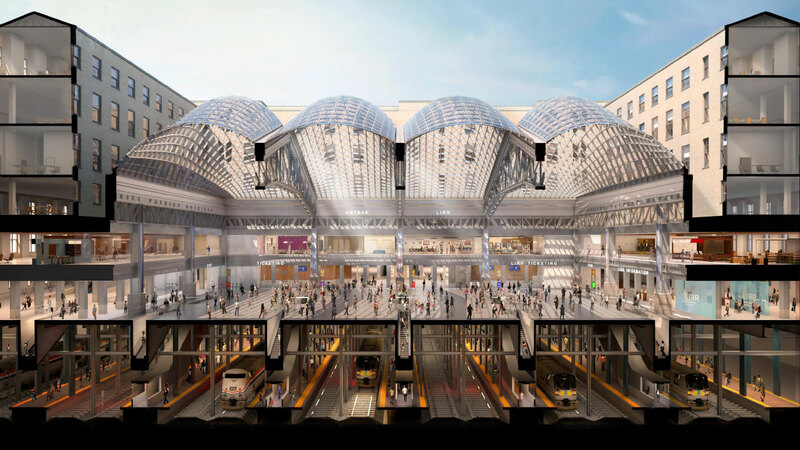 With better access to trains and subways and state-of-the-art infrastructure, the Moynihan Train Hall seamlessly joins history, architectural design, and function, bringing the nation’s busiest rail station into the 21st century." McKim, Mead and White designed both the Farley Building and the original Penn Station. The latter was lost in 1963 but now the New York architecture firm's work will once again be used for the station, serving as a grand entrance. Inside Moynihan Hall, where nine platforms and 17 tracks will be accessible, a 92-foot high skylight will be built above the hall's iconic steel trusses. The hall will also facilitate access to the Eighth Avenue Subway as well as provide an entrance to the station from 9th Avenue. In addition to the work being done at Moynihan Hall, the width of the 33rd Street Corridor will be almost tripled as part of a "comprehensive redesign" of the LIRR concourse. Cuomo's office also stated plans for "extensive renovation" to the adjacent Seventh and Eighth Avenue subway stations. 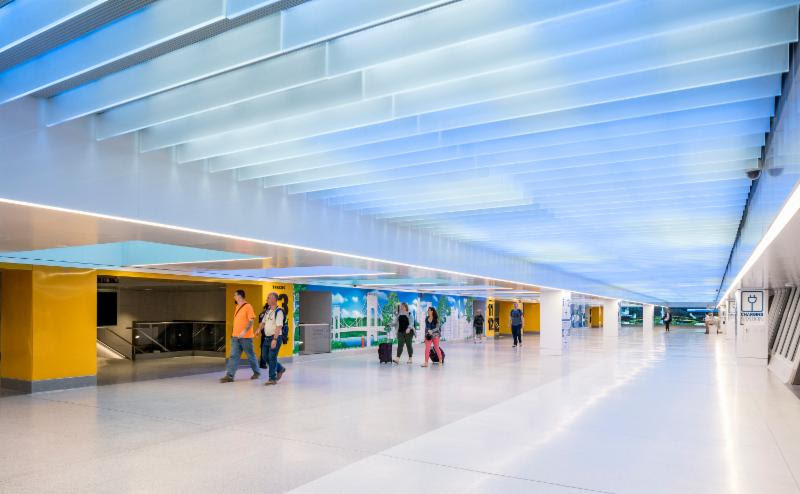 Furthermore, additional changes to Penn Station include upgraded lighting and signage, new digital screens, and adding LED panels that projecting blue skies. 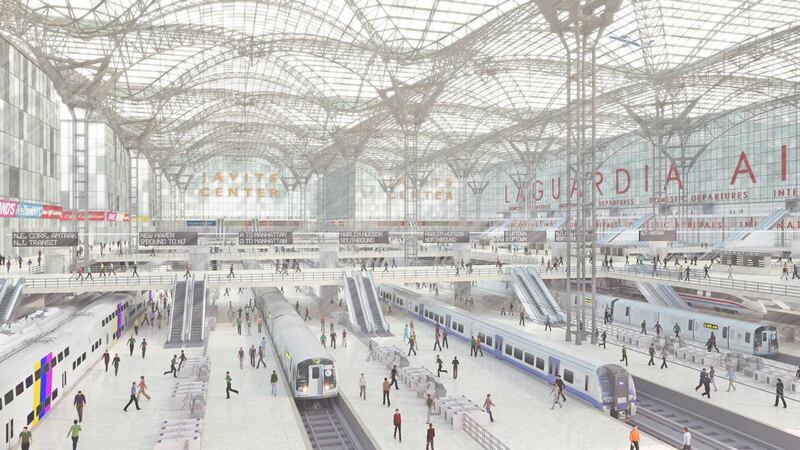 According to Crain's New York, Cuomo's plans will only aid around a fifth of Penn Station's 600,000 daily commuters. The work is scheduled to be complete by the end of 2020. That, however, might not be soon enough for those in line for what Cuomo has described as an upcoming "summer of hell" with track shutdowns for repairs set to cause commuter despair. "You'll see… breakdowns for the foreseeable future," said Cuomo. "We need major renovations at Penn and… an organization that can actually do them." "We would be crazy to do something without Vornado," Tom Wright, president of the Regional Plan Association, who was named Cuomo's committee for the Penn Station project, told Crain's. "They have shown themselves willing to put skin in the game, and they see what's good for the public is also good for them. An improved station boosts the value of so much of Vornado's real estate." The plan is being carried out and financed by Empire State Development and Related Companies, Vornado Realty LP, and construction firm Skanska's U.S. arm. Divided up, $550 million will be state supplied and $420 million will come from Amtrak, the MTA, the Port Authority and federal grants. The remaining $630 will be provided by Vornado and Skanska who in return for building it will have the right to run the new commercial concourse. The creation of a new or renovated Pennsylvania Station for New York has become a staple for the local daily news. It is often presented as an architecture issue: the need for an alternative to the seriously flawed 1968 building on the site, or a quick fix for its 21 aging rail tracks. But ReThink Studio, a transportation think tank, has a well-thought proposal that considers a future for the station as a node in a much larger regional plan. It makes the point that any proposal to transform the station is meaningless unless its relationship to a much larger area is considered and well thought out. It is not just an architectural issue, but a planning issue that needs to be addressed by all levels of government. Today, New York’s commuter rail infrastructure is a nightmare. Fixing this starts with phase one of Amtrak’s Gateway project for two new Hudson River Tunnels. Former Vice President Joe Biden has said that all of us need to push for this effort. You can watch a video of ReThink Studio's plans below. If you are convinced by its conclusions, there is now a way to contact our elected officials and ask them to support the plan. 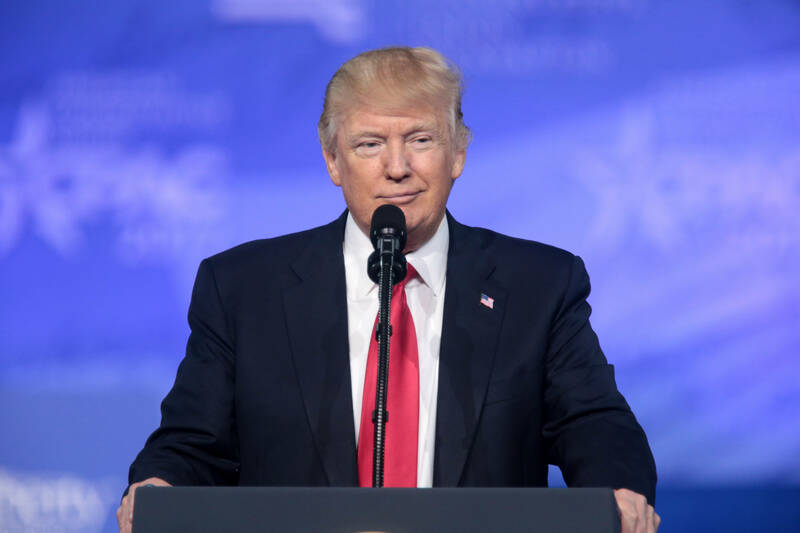 By signing this petition, the studio will send a letter to President Donald Trump; Senator Mitch McConnell; Representatives Paul Ryan, Bill Shuster, Rodney Frelinghuysen; and Senators Mitch McConnell, James Inhofe, and Thad Cochran. The redesign of Penn Station offers not just a chance to raise the building’s roof, but is also a unique opportunity to unify the region’s disparate rail networks in a way that has not been possible in over a century. Unfortunately, the recent proposal by Governor Andrew Cuomo and another by Partnership for Architecture and Urbanism (PAU) don’t think broadly enough about the underlying transportation problems afflicting the station and, worse yet, they solidify its already dysfunctional setup. Most of Penn’s issues are founded in its overloaded capacity. When the station opened in 1910, the Pennsylvania Railroad was one of eight railroads providing service into New York City. While other railroads terminated at waterfront stations, the Pennsylvania Railroad was the first railroad to cross the Hudson and East Rivers. Its Midtown Manhattan station provided through service for long-distance trains and terminal service for commuter rail from New Jersey and Long Island. This is how the station still operates today, with one crucial difference: Over the past century, all the waterfront terminals except Hoboken have been closed, and the trains that served them have been largely rerouted into Penn. The resulting congestion has been exacerbated since the 1990s by a shift in preference toward Midtown’s office district and New Jersey Transit’s decision to reroute as many lines as possible into Penn. Today, Penn Station serves 650,000 commuters each day. That is more than twice as many at its peak in the 1940s, and three times what its initial design accommodated. Furthermore, both New Jersey Transit and Metro-North would like to bring even more trains into Penn—both from existing and proposed routes. Expanded service into Penn Station will not be possible without significantly increasing its capacity—a need that Governor Cuomo and PAU’s proposals ignore in lieu of retail space and glass ceilings. Understanding Penn’s capacity limitations (and how to solve them) is critical to a good design. They exist in three forms: passenger crowding, train traffic, and systematic connectivity issues to the rest of the region. On a passenger level, overcrowding is mitigated through staged boarding, or letting passengers onto the tracks only after trains arrive and unload. This produces chaotic lines and rushed transfers, especially in the area of the station that NJ Transit uses. Images of Governor Cuomo and PAU’s proposals suggest that the platform width and vertical access would both remain unchanged in the new Penn Station. Preserving existing stairs to the platform level, as PAU proposes, is not enough; Penn needs more vertical access. Rather than working to preserve inadequate stairwells to the platform level, we should be fighting for more stairs and escalators. On a track level, the station is also hopelessly congested. Incoming trains often have to wait in tunnels for ten minutes or more as other trains exit the station. This is because the station is operated primarily as a terminal rather than a through station. Trains must cross each other as they enter and leave the station. Through-running avoids this problem by scheduling eastbound traffic on southern tracks and westbound traffic on northern tracks. Each train could enter the station, unload and load passengers, and continue on without ever crossing oncoming traffic. Penn’s present configuration makes through-running impossible because only two tracks connect to Penn from New Jersey, while four tracks connect to the station from Queens. Amtrak’s current Gateway proposal would remedy this by building two additional tracks between Penn and New Jersey. Unfortunately, none of the schemes put forward thus far recognize this unprecedented opportunity to expand the station’s capacity. PAU’s analysis of Penn’s lack of connectivity at the neighborhood scale only tells half of the story. As a transit hub, the most important function of Penn Station is not on foot at street level, but underground at a track level. Furthermore, as one of the two regional rail hubs in New York, a redesign of Penn Station offers a uniquely valuable position to solve numerous problems at just as many scales. The schemes put forward thus far fail to look beyond the neighboring blocks of Midtown Manhattan. Our ReThinkNYC proposal does. By understanding the regional importance of Penn Station, we are able to use infrastructural opportunities to not just solve present day problems within the station, but to improve connectivity on a regional scale. We would reduce passenger crowding by extending all platforms to pass below neighboring Moynihan Station, currently the Farley Post Office. Some platforms already extend under Moynihan and other platforms should be extended as well. This would increase stair and escalator access to platforms for every carrier. We would widen the platforms, reducing the current 21 tracks to 12. This potentially counterintuitive move has significant benefits: Wider platforms allow passengers to board safely and quickly at track level, much like New York’s subway service, and this would decrease the amount of time each train would need to sit at its platform. By staging this work, it would be possible to extend and widen the platforms without interrupting service. We would use the new Gateway tunnels to implement through-running at Penn, allowing trains to enter and leave the station efficiently, without crossing each other’s paths. By permitting carriers to bring more trains through the station, Penn will be able to serve a growing New York City for years to come. Not only will these track-level changes increase passenger and train capacity, but by bringing more trains through the station, we can dramatically improve the city’s connectivity as a whole. This includes NJ Transit trains that currently only go to Hoboken, LIRR lines that need more service but have no track space at Penn, and some Metro-North cars, that would be diverted from Grand Central. Furthermore, bringing Metro-North into Penn would have the added benefit of unifying the region’s three commuter rail lines into one station. 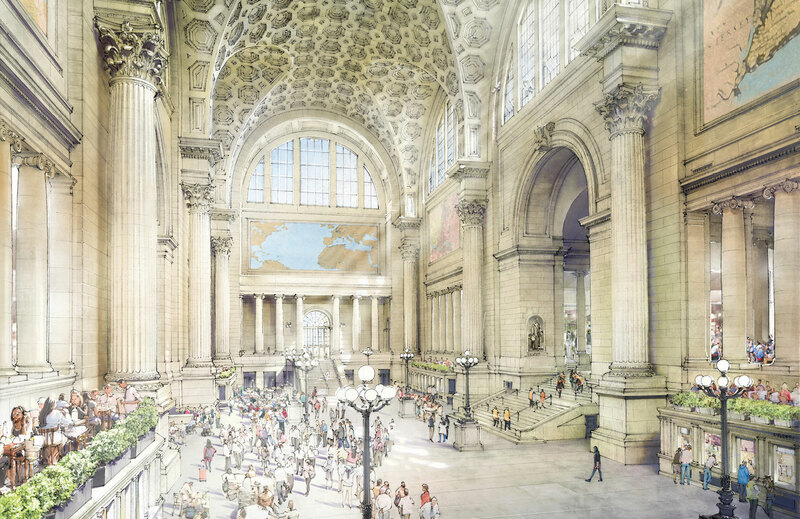 Redesigning Penn Station is about understanding its role within the New York region as a whole. The Gateway tunnels and Moynihan Station present a once-in-a-century opportunity to make Penn a transportation hub that both serves and stimulates the entire New York region. Proposals for vaulted ceilings and inspiring spaces would certainly make the station more beautiful, but are incomplete gestures if they fail to also address the more serious issues on a track and capacity level. 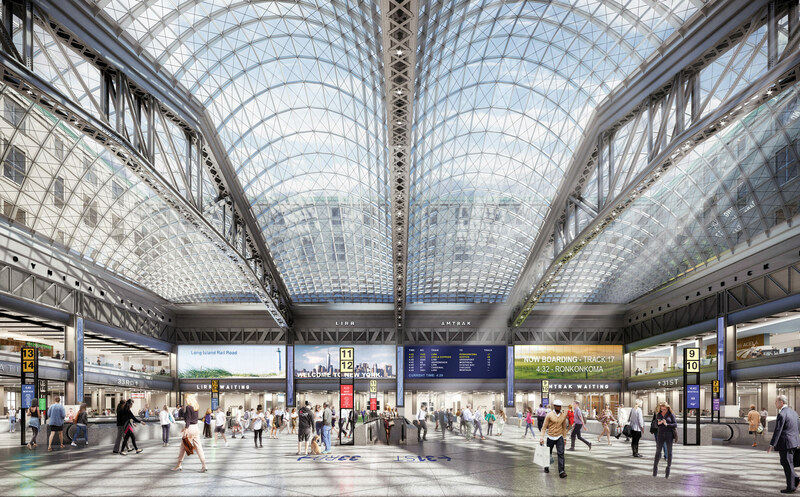 In Penn Station, we have a rare opportunity to create a world-class station with the capacity and connectivity that New York needs. To give the city anything less would be a detriment not just to the station, but the region as a whole. For more on ReThinkNYC, visit their website. Jim Venturi has a habit of being a rogue planner with his team at ReThinkNYC. Last year, he suggested using Riker's Island to expand La Guardia airport and now he is taking on New York and New Jersey's suburban rail network. 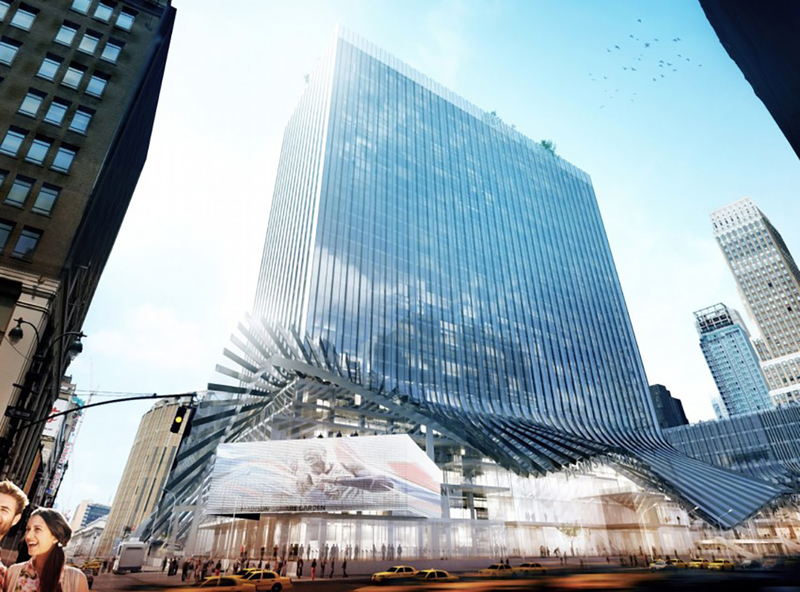 His plan counters the current federal Gateway Project which proposes a high-speed rail link into Manhattan and the creation of a new terminus at Penn Station. Due to open in 2024, the plan aims to alleviate bottlenecking by adding 25 new train slots for use at peak times by Amtrak and New Jersey Transit (NJT) along the North East Corridor (NEC) between Newark and New York City. Currently, those tracks are at full capacity. https://vimeo.com/161951825 If realized, the project would see the demolition of Napoleon Le Brun's St. John the Baptist Church which dates back to 1871, a historic piece of French-Gothic architecture that is a well established part of Manhattan's urban fabric. Of greater importance for Venturi, however, lies with the continual use of Penn station as a terminus and not a through station. From an infrastructure perspective, capacity problems arise with terminuses: trains have to enter and leave, creating more traffic, while passengers often have to alight to catch their connections, which leads to overcrowding. This happens to the extent that trains often wait up to ten minutes before entering the station and passengers queue at platform escalators, something that train schedules have since incorporated as status quo. Penn Station is already the busiest station in the country. It's platforms, in comparison to other regional stations, are very narrow. Since the addition of escalators and the advent of other modern day needs, available space has further decreased. To counter this, ReThinkNYC has devised a system whereby tracks are surrounded on either side by platforms. In this scenario, people can alight on one side and embark on the other, thus potentially improving circulation with people no longer getting in each others way. 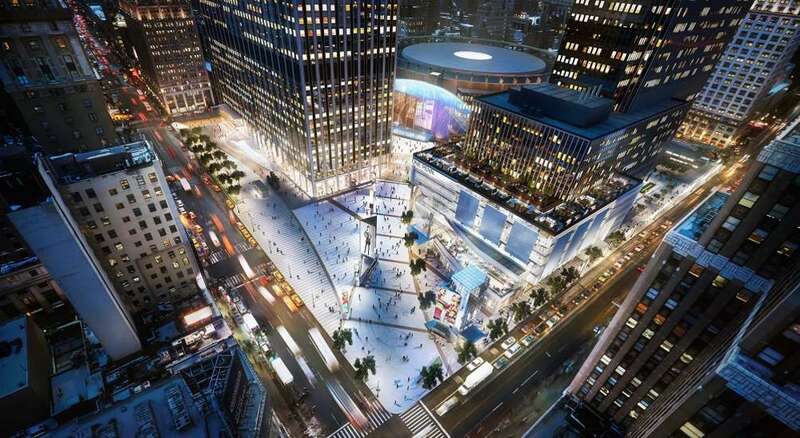 ReThinkNYC also proposes that Penn Station becomes a through-station. This is nothing new. Indeed, the station is already a through-station for Amtrak services though is not for the Long Island Railroad (LIRR) and NJT. Speaking to AN, Venturi spoke of how terminuses are all too commonplace in a region which currently holds three, run by four operators—MetroNorth, NJT, LIRR, and Amtrak. Efficiency and connectivity are the crux of ReThinkNYC's plan, with services being more accessible for passengers. "We need to think bigger," Venturi says. The current proposed plan, Venturi explained, is a "quick fix" bereft of longterm foresight and the result of of a system that is seldom fed any infrastructural ideas. He said this situation stems from a growing disparity between revenue and power centers between Washington D.C. and New York. "Our plan is very boring" he adds, going on to say that in "any other country, our idea is completely normal." And he's not wrong. Across Europe, through-stations in cities have become commonplace, with Berlin's Hauptbahnhof leading by example, running tracks through the station on three levels in different directions. "As far as I can tell we're the only city in the developed world that is building new terminals," as opposed to through-stations, he said. Paris and London are two notable beneficiaries of modern day through-service plans, and even closer to home, Philadelphia has done the same. If the Gateway project were to be a through-station, Venturi explained, Amtrak services could continue up to Queens and the Bronx. A "trunk" line where all four operators overlap running through Penn Station would be established between Secaucus Junction (NJ) and Sunnyside in Queens. At either side of these stations, services would then diverge; most on the Queens side would go to Port Morris in the Bronx where a new rail yard would be located. This would then prevent Amtrak from reaching capacity at the Sunnyside rail yard and allow NJT services to run through Penn Station. This system, which is very much like the Paris, London and Philadelphia examples above, would allow sidings (i.e. freight stored in a train yard) to sit on the periphery while allowing the "core" to be a place where passengers can transfer onto the subway system and other suburban rail services For this to happen, though, NJT would have to move their terminus eastward to Port Morris while LIRR would have to follow suit in the opposite direction to Secaucus. https://vimeo.com/163764271 While Venturi's scheme calls for the construction of three tunnels and a new viaduct (see video above) to essentially connect the Hudson and Harlem lines and the NEC, the plan also utilizes much unused infrastructure. Track beds that were never filled would be electrified and the Hell Gate bridge, which was originally built to hold four tracks would finally be used as such. For ReThinkNYC's plan to be realized, Venturi has broken it up into five phases as can be seen below. Electrification however, is another issue. Metro North and LIRR use two variations of the "3rd rail" electric connections to power their trains (one is a high contact platform, the other is low). To make things more complicated, 3 different catenary (overhead electrification) standards are used, so in the cases of lines that use overhead contact, 3 variations of voltage/Frequency output (Voltz/Hertz) are also used. This, of course, can all be changed, accommodating all these systems takes up valuable space in carriages and is generally seen as impractical. In comparison to Europe, two forms of electrification dominate the rail networks. Known as Electric multiple units (EMU's), trains make use of a 3rd rail/overhead hybrid contact system which has become commonplace, thus allowing freight and passenger rail services to cross borders without hassle. In the US, however, a lack of standardization appears to be halting progress in this respect. https://vimeo.com/161960566 Though a major overhaul, the practice of setting such standards in the UK was achieved after WWII when the railways were nationalized and the 25 kV 50 Hz overhead system was installed and the 3rd rail system developed in the South East with the exception of the Eurostar service. In light of all this, there is still room for improvement. Venturi explains how a connection between Trenton and New Haven could be easily realized. "It seems obvious," he says. "Just draw a straight line between Trenton and New Haven." In this case, similar types of rolling stock could be used due to the way these lines are electrified. Despite the ominous outlook of the East coast's rail network in comparison to the rest of the developed world, Venturi is adamant that a "rail revival" is happening, or at least underway.